AQ Android Video Converter can convert various videos to android MP4,MP3. ...... You can preview video files, edit videos ,and set video profile parameters. AQ Android Video Converter can convert all videos,including AVI, MKV, MP4,DivX, XviD, MPEG, WMV, MOV, ASF, 3GP, MOD, FLV, High-Definition YouTube video formats,etc, to Android video formats. With AQ Android Video Converter,you can convert all popular video and audio formats to Android supported audio formats, such as MP3,AAC,WAV,WMA. 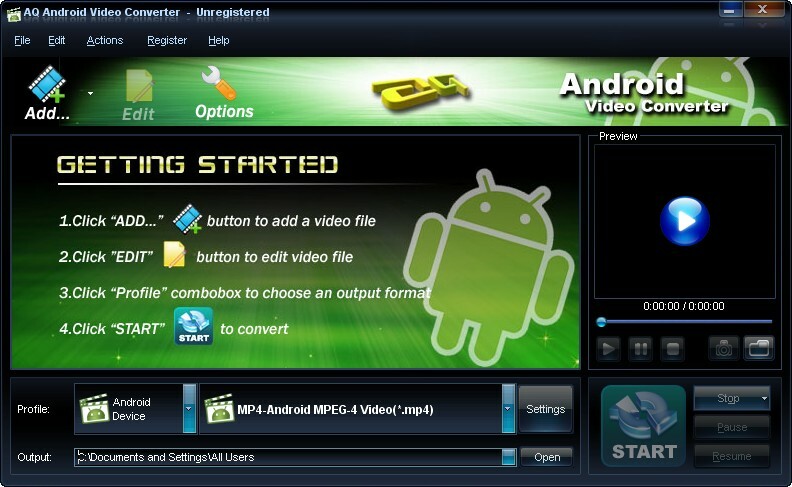 AQ Android Video Converter supports all types of Android phones including HTC, Samsung, Philips, OpenMoko, Motorola,etc. AQ Android Video Converter could easily convert any video and audio file to Android MP4, MP3,AAC.formats. Qweas is providing links to AQ Android Video Converter 1.7 as a courtesy, and makes no representations regarding AQ Android Video Converter or any other applications or any information related thereto. Any questions, complaints or claims regarding this application AQ Android Video Converter 1.7 must be directed to the appropriate software vendor. You may click the publisher link of AQ Android Video Converter on the top of this page to get more details about the vendor.